Micro Matrix Systems is one of only a few stampers offering capabilities in both the fourslide and high-speed press arena. 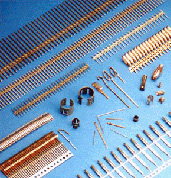 Our experience includes the manufacture of parts and components for a wide variety of industries including the automotive, computer circuit, and commmunication. For additional information, please review the product categories below. From the idea stage to final part, MMS is ready to undertake all of your Engineering challenges. We welcome the opportunity to visit you in order to outline our capabilities in detail. Prototyping is desired prior to many new tool builds to ensure the most robust part design. We incorporate wire EDM and single hand forming operations to prove out the design when desired. Bruderer and Minster type precision presses are incorporated for high volume production of precision, tight tolerance components using wire-to-strip and strip-to-strip bandoleering. Micro Matrix Systems is a corporation specializing in high-speed precision stamping of communication and computer circuitry components as well as products for newer industries such as automotive electrical safety deployment devices. Utilizing NILSON Fourslide machines to offer lower-cost fourslide tooling for shorter runs to Class A progressive dies for those jobs requiring millions or billions of parts. Micro Matrix Systems is the leader in providing Total Quality Service to our large customer base. Our forte is thin gauge products that require close tolerance forming. Our Fourslide machines can handle material up to 1.1 inches wide with a maximum feed length of 6 inches and thickness up to 0.032". Wire from .007 to .085 inch diameter and flat stock from .0015 to .062 inch thick and 5.5 inches wide can be run in our presses. We produce multi-up carbide-inserted custom tooling for the Interconnect and associated industries. Modern techniques in wire EDM, contour and jig grinding are utilized to achieve progressive dies for optimum performance. A specialty at Micro Matrix Systems allows wire or flat stock parts to be “carried” at a specified centerline to accommodate plating and assembly processes with production volumes of header or bandoliered pins exceeding billions of pieces each year. MMS serves the Interconnect and related industries. In-house wire EDM supports our tool building department. MMS offers a complete line of open-tooled bandoliered pins, retention clips, ground springs, gas appliance clips and related products. Please contact us for current availability. For an immediate quotation for bandoliered pins, please advise the overall length, Bandolier location and quantity of whichever pin(s) you are interested in purchasing. We will immediately quote the piece part prices, leadtimes and any applicable tooling-insert charge. Note: For part lengths and Bandolier locations that are already tooled, there will be no tooling charge. In addition, tooling-insert charges are waived for orders of five million and above. Loose Pins: Loose pins are available from our open-tooling as well, with typically NO TOOLING CHARGES. Leadtimes are typically within one-to-two weeks ARO assuming raw material is in stock at MMS.